A Case of déjà vu? The Italian General Election held on the 4th March 2018 produced a politically divided country. This Italian election bears similarities to a number of important elections that took place last year across Europe, such as in France, Germany, Austria and the Netherlands. This article provides a short summary of the key trends and patterns from last week’s Italian General Election. This result has broader implications for the future direction of the EU and ties in with our EAP Hong Kong November event from last year that outlined how establishment parties on the left and right of the political spectrum are under attack, primarily from populist radical right parties. The decline of traditional social democratic parties. The rightward shift of voters in response to concerns over key issues such as immigration, refugees and security. The ‘rise’ of younger and newly emerging parties, such as the Italian Five Star Movement, Alternative for Germany alongside Emmanuel Macron’s En Marche who are gaining voters in their ranks who are fed up with mainstream parties alongside the political establishment class. The results of the Italian election from last week therefore fit into this broader narrative of electoral decline, with the decline in vote share for traditional left-wing/social democratic parties in the Italian general election 2018, compared to the previous one held five years ago in 2013. The Democratic party experienced a sharp decline, with only 9% of vote share recorded. There was a significant increase in vote share for populist right-wing parties. The Five Star Movement (32.2%) was the party with the single biggest share of support in the 2018 election, while Lega (the League) (7%) leads the centre-right coalition (receiving 37.3% of vote overall). 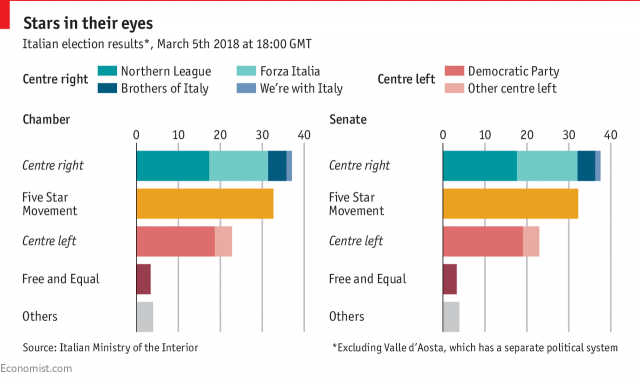 Therefore, the chart below from the Economist further depicts widespread patterns of electoral volatility in the Italian election. EU: The governance of the EU is under threat. ‘Rise’ of populist anti-EU Eurosceptic/right-wing parties. The Five Star movement spelled out its intention to hold a referendum on Eurozone membership, among other criticisms on/suggestions to reform EU policies on migration. Immigration: More than 600,000 migrants have arrived on Italian shores over the past four years, making immigration a central concern for voters during the campaign. The Lega and the Five Star Movement, which emerged as the largest party both promised to ramp up deportations of illegal migrants. The shift in support to the anti-establishment right parties is likely a result of Italian voter’s discontentment with the ruling centre-left government’s failure to tackle high unemployment and surging migration. Economic crisis: switch of left-right stance on economic policies. The so-called economic backwardness of Italy has its roots in the immensely degraded political culture of the country’s elite. The future of the EU is under threat from (1) populism and (2) lack of trust in politics and politicians (especially in the context of ongoing events such as Brexit). A ‘eurosceptic’ government would likely throw a wrench in French President Emmanuel Macron’s ambitious plans for deeper European integration. The results suggest a lower likelihood for Italy to play a major part in planned closer EU and Eurozone integration. The Italian election was characterized by wide patterns of electoral volatility (established mainstream parties losing out electorally). The populist and ‘Eurosceptic’ Italian 5 Star Movement caused a ‘political earthquake’ and gained large support in the South of Italy. The right-wing nationalist party the League surged in the South and extended its voters based out of its traditional Northern heartlands. Factors such as migration (values based) and the increasing economic divide in the country (large debt in the Italian economy) arguably played a prominent role in this election. This result has broader implications for the future direction of the EU. Despite a sizeable electoral earthquake, it should be noted that neither the Five Star Movement nor the centre-right coalition will have an absolute majority in the Chamber of Deputies or the Senate.